If you have a Mac, make sure you take it to The Headland Villas. The five properties on this luxury development are elegant, stylish, compact and desirable enough to have been designed by Apple Inc. There's something extremely satisfying about reclining on a cushioned sunbed by a blue-tiled swimming pool, tropical islands silhouetted in the distance while you chat on Skype, courtesy of the villa’s WiFi access, knowing that you fit the scene perfectly. 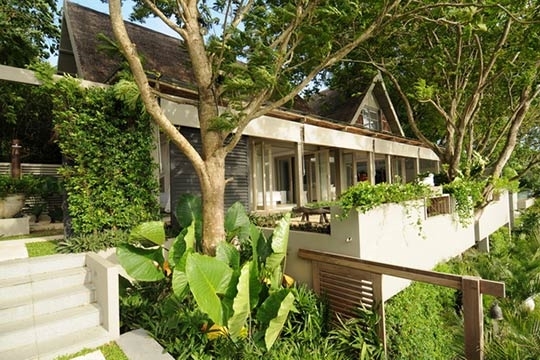 But it's not just the modern touches that make this villa (and neighbouring Headland Villas 2, 3, 4 and 5) so special; it's the way its design is so perfectly integrated into the stunning, natural setting. 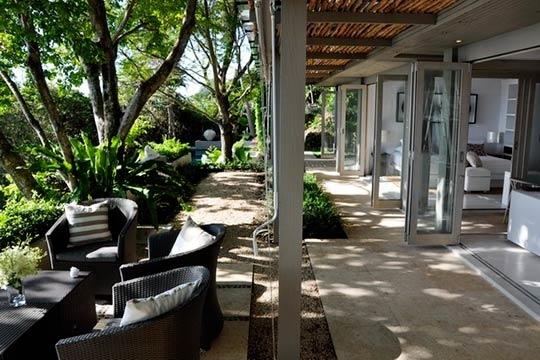 Clever features like folding doors (front and back), with roller blinds for daytime shade, add new meaning to the well-used phrase ‘bringing the outside in’ and keep the villa blissfully cool. These touches, along with an intelligent use of space make what is essentially quite a compact residence feel very roomy. It's therefore easy to switch between pleasures on a whim. You can wander straight from your king-size bed down to the pool to float in peace surrounded by tropical greenery and the soothing sound of crickets, then pop back to your bright, open-plan bathroom for a refreshing rain shower before grabbing a snack and freshly brewed coffee on your way upstairs to watch a movie in the TV lounge overlooking the sea. The staff, like the decor, are discreet. There's an efficient daily maid and a friendly, knowledgeable on-site manager, but once you've enjoyed your healthy continental breakfast (included) you can turn the service on or off to suit your day (a full-time chef and provisioning are available at extra cost). It's a steep climb down to Taling Ngam beach but well worth the effort as you'll probably have it to yourself most days. Restaurants and resort-style amenities are in nipping distance, while boat trips, fishing trips and elephants rides are easily arranged. Drinking in the cinematic views with Vivaldi flowing through the Bose surround-sound system in the lounge is nothing short of living poetry. Versatile private comfort in a secluded natural setting. 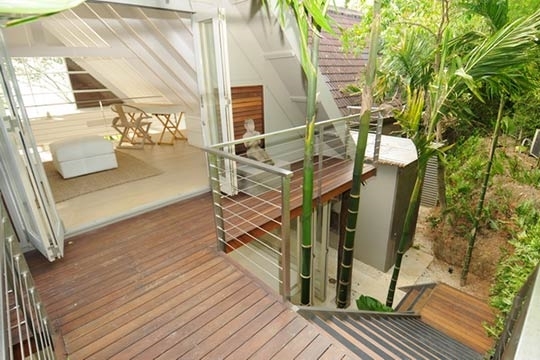 You'd be hard pressed to find a more romantic spot than The Headland Villas. The sunsets are unbelievable and the design definitely lends itself to love, with special touches like private bathroom terraces and sliding wooden shutters outside the bedrooms for added privacy. Even if you bring the kids or share with friends you can easily escape to your own space (upstairs in the TV room, for example while the kids are in the pool). For those craving company and variety, being virtually inside the grounds of a luxury resort means the options for dining and entertainment are far more diverse than you would expect in such a secluded location. 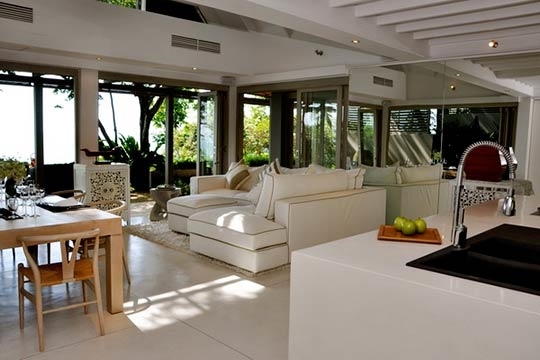 The cool, white decor and uncluttered interiors not only show off your sun tan, but also mean you don't worry too much about drifting between the pool, terrace and fridge in your beach gear. The staff keep a low profile and are 'on-call' rather than 'in-situ' for most of the time (although extra hands can be brought in, as needed, at extra cost), so you're left to do your thing in satisfied peace. Being part of a small estate also gives you the option of hiring more than one of The Headland Villas for a family gathering or celebration. Once ensconced in your own villa, however, you neither see nor hear your neighbours unless you want to. 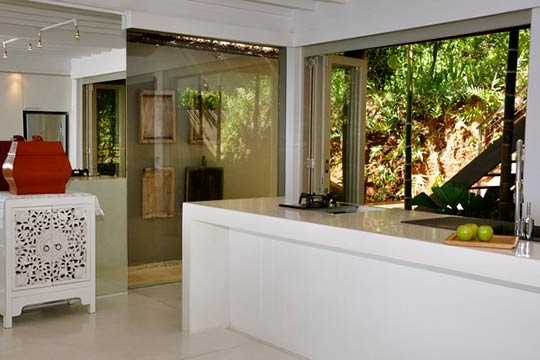 It's quite rare, even on Samui, to find such modern comforts so close to unspoilt nature and traditional island life. The combination of the two makes for a memorable holiday indeed. 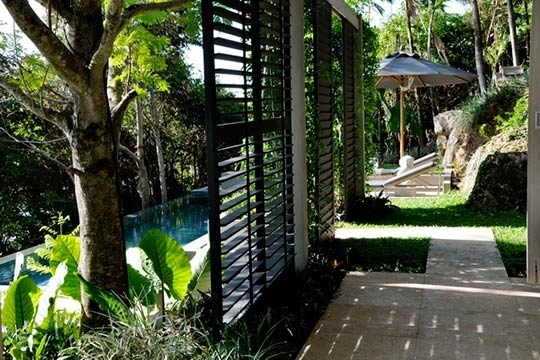 Since our initial visit three years ago, the Headland Villas have flourished and now blend even more naturally into their surroundings as the gardens have become more established. The properties have been well-maintained, with little evidence of wear-and-tear. 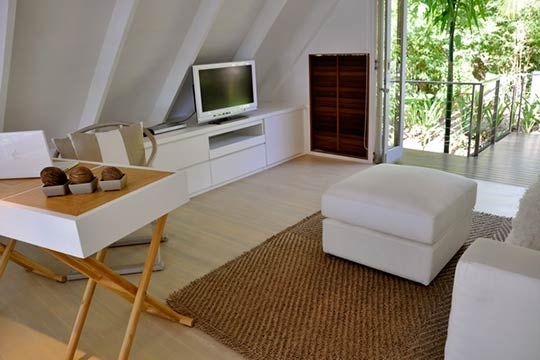 No TVs in the bedrooms may put some people off, others (especially families with kids) may appreciate the break from constant visual gratification and with a dedicated AV room upstairs you still have the choice to slouch in front of the box. Being so open to the elements means insects might also feel welcome. 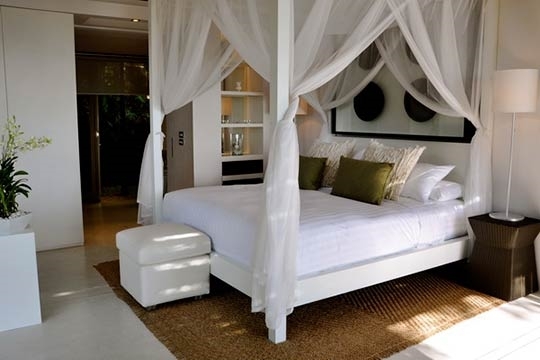 The roll-down blinds do not completely close off the rooms so a swift lock down in the early evening is advisable to prevent mosquito stress (the four-poster has netted drapes). One of the best villas I have been to. 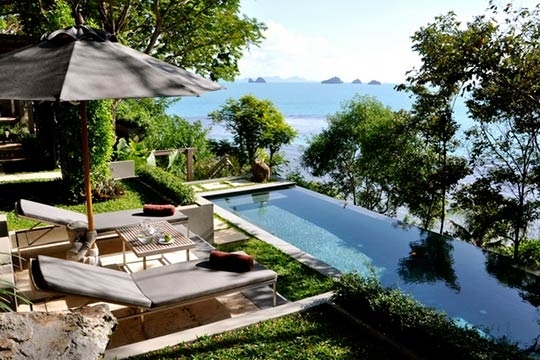 The Headland Villas are set on a secluded cliff side overlooking a stunning bay with small islands stretching to the horizon. 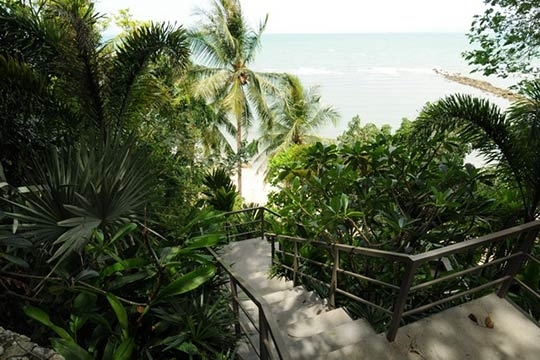 Interconnecting pathways and steps lead to each individual villa entrance and down to a semi-private section of Taling Ngam beach that's quite rocky in places but swimmable at high tide and shared only by occasional guests from the nearby InterContinental Baan Taling Ngam Resort. The guarded (public) road that leads to the villas’ car park is also used by this up-market resort. The villa manager can organise buggies to take you to the resort's restaurants and spa facilities. A one- kilometre drive (the road is walk-able, but steep) takes you to Baan Taling Ngam village and beach offering a handful of low-key resorts and restaurants, plus a peaceful temple to visit. 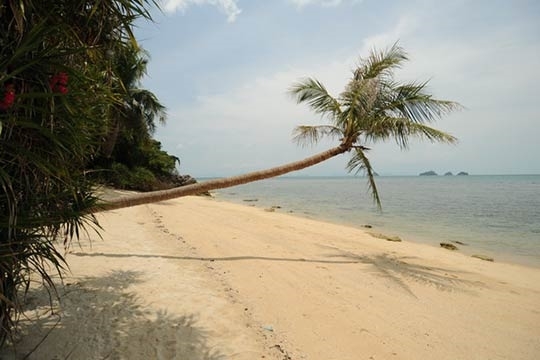 Baan Taling Ngam boasts two pleasant beaches separated by a steep, rocky headland. This is one of Samui's most secluded locations and the local village is also one of the few remaining traditional communities where life continues as it has done for decades. However, thanks to the nearby resorts and local beachside dining options, there’s still a reasonable choice of places to go if you do want to venture out to eat. You can also rent boats to visit the offshore islands of Koh Taen and Koh Matsum, passing the dramatic, uninhabited Five Islands on the way. The nearest town of consequence is Nathon, 10km to the north. This is the island's port and administrative capital with banks, supermarkets and souvenir shops lining its main street. Heading south takes you to Tong Krut (5km) a sleepy fishing village similar to Baan Taling Ngam. Lamai (15km), on the opposite coast, is Samui's second largest tourist town and a bustling centre for dining, shopping and nightlife. 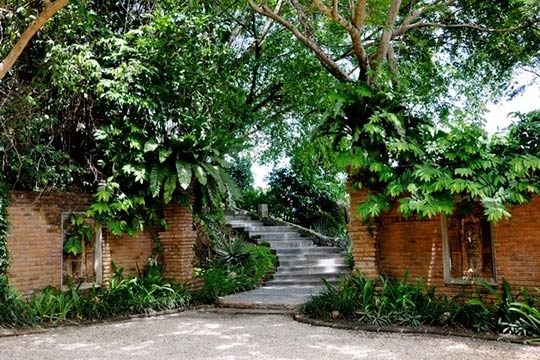 From a communal car park, landscaped steps and walkways lead to the five Headland Villas. Climbing the stone steps to Villa 1, you first reach the 14m infinity swimming pool, backed by an attractive rockery, with loungers placed for sun and views. From there, more steps double back to the main olive and white, thatch-roofed building, fronted by a wide, partially covered terrace that affords 180 degree coastal views (particularly beautiful at sunset). Outdoor furniture includes comfortable cushioned rattan couches, daybeds, coffee tables and white marble statues. These couches are as ‘flop-in comfortable’ as the inside sofas, perfectly extending the interior living spaces with the exterior. The first room inside the main pavilion is the airy master bedroom that boasts folding doors opening on two sides and roller blinds for day-time shade. There's a contemporary king-size four-poster bed with draped netting, built-in storage, striking contemporary artwork and steel bedside lamps to complete the scene. 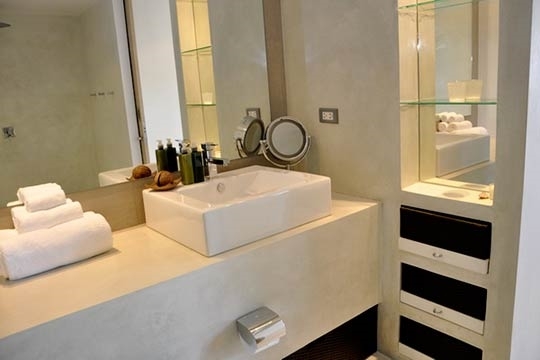 The room opens onto a spacious ensuite with rain shower, beyond which is a private garden, guaranteeing plenty of natural light. 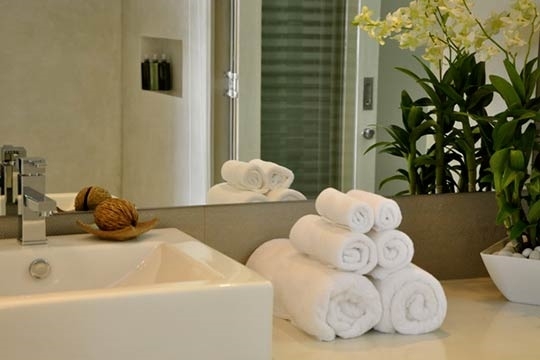 The adjacent room is a mirror image of the master, boasting the same cool bathroom amenities, but with twin beds. Back downstairs the spacious (made more so by a mirrored wall), white, open-plan living and dining area is served by a well-equipped (with brand name appliances) kitchen and breakfast bar. Built-in cupboards have enough crockery, glasses and cutlery for a dinner party. One also houses the mood lighting controls and a powerful stereo system which feeds white, Bose speakers mounted on the lounge walls. The dining table seats eight, and there's an inviting sofa close by to sink -into when you're full. 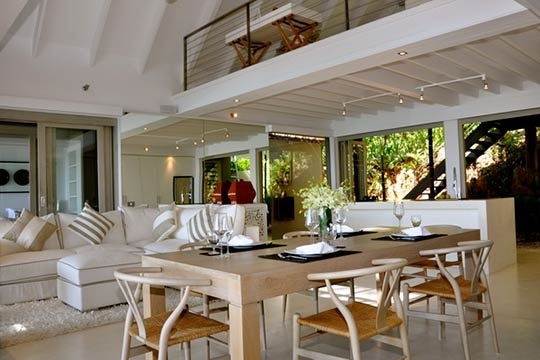 The entire room appears to fold out front and back to welcome the views and sea breezes, but there's the option of air conditioning and ceiling fans (throughout the villa) to supplement. 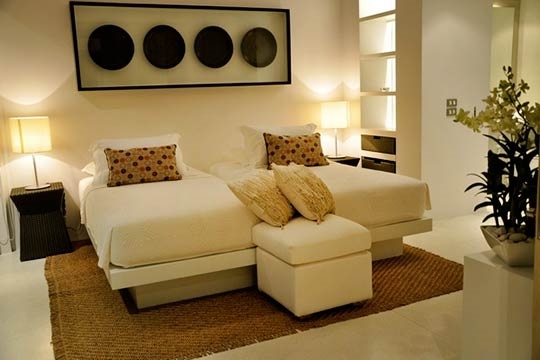 Lower rates are sometimes available for this villa if 1 bedroom is used. Contact Customer Service for details. 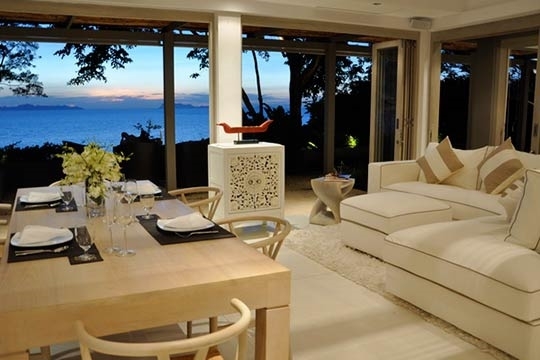 2 bedroom villa located in Taling Ngam, Koh Samui. Ideal for Beach in ten, Body and soul, Kid friendly, Gastronomic delights, Fair share for groups, The great outdoors, Romantic retreats, Room with a view.